I must admit to some end-of-civilization thinking when I read about the frenzied Wal Mart shopper on “Black Friday” who pepper-sprayed 20 other customers competing for a bargain. I had a similar reaction when police in riot gear waded into Occupy Wall Street protesters, and one UC-Davis campus policeman calmly doused non-violent students with military-grade pepper spray, making sure he aimed it down their throats. These aren’t peaceful times, so I guess we shouldn’t be surprised when shoppers lose control and policemen use police-state equipment no matter what the threat level. In the so-called “politics of shouting,” perspective and nuance vanish faster than the truth. I did take heart in this morning’s report that finance-industry recruiters are meeting a chilly reception on some college campuses. Even though right-wing commentators scoffed at Occupy Wall Street and deemed its eviction from public parks a sign of defeat, it seems to me the movement got far more traction than a few tents might indicate. It was always about attitudes, stories, changing the dialog – and not about occupying land. In that sense, OWS was a resounding success. It will be a lasting good if bright young minds realize there is more to life and career than managing money. Better to exercise creativity, seek innovation, start new enterprises, make worthwhile products, solve significant problems, make the world better. Yes, those enterprises will require well-managed funds, but let’s keep first things first: start with ideas, dreams, imagination. Q: Is it feasible in the world today to preach everyone should commit themselves to poverty? A: It seems to me the point isn’t poverty for all, as if scarcity were the rule of the universe, but sharing for all. God’s creation is abundant – or could be abundant if a few didn’t insist on owning far more than everyone else. Greed distorts God’s order and prevents God’s abundance from reaching all. 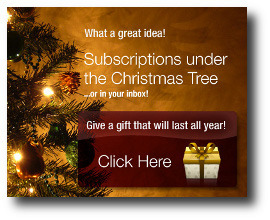 Click here to give a gift subscription to a friend.